Every worker deserves a safe workplace, and it’s a good business practice to provide a healthy and safe working environment for your workers. It improves key metrics such as employee job satisfaction and retention, while reducing turnover rates and the attendant HR costs of recruiting, hiring and training new workers. Secondly, workplace safety is mandated by law, and you need to be in compliance with health and safety regulations. Since you have to do it, and it’s good for business, make use of these workplace safety tips to create a model working environment for your employees. 1. Establish an orientation program. One of the main reasons for workplace accidents is the lack of proper safety orientation program for workers. So create your organisation’s safety manual, and communicate to your workers the organisation’s safety objectives. Conduct safety review programs regularly, and include first aid training and CPR in the orientation. 2. Maintain workplace injury records and registers. Maintain a register to record all work-related injuries. It should include all the details regarding the accident such as the date of occurrence, time of occurrence, and the nature of injuries. It should clearly state who was the injured worker, from what department, and how it happened, the location, etc. Also include witness statements from others who were present, and what (if any) action was taken as a result. A detailed injury register like this allows you to analyse these incidents and take corrective steps to prevent it from occurring again. 3. Create a joint health and safety committee. The committee will have both worker and management representatives as members. It will be responsible for discussing accident prevention methods and propose required actions. The committee will discuss the workers’ safety concerns and recommend steps to address the same. Plan and conduct safety training programs, and conduct daily workplace inspection for hazards and take immediate corrective action. 4. Set proper working hours as per law. Lack of concentration is among the most common causes of workplace accidents. Working long hours without rest breaks can lead to stress and loss of concentration. So set your working hours within the norms specified as per law. This means a maximum of 60 hours per week, including 12 hours of overtime. 5. Issue personal protection equipment. Not wearing proper personal protection equipment (PPE) is again one of the prime causes of workplace injuries and accidents. Issue proper safety equipment like safety shoes, hard hats, safety goggles, ear muffs, ear plugs, gloves, etc. Many workers will avoid using protective equipment because they find it cumbersome, and they will only put it on for show during safety audits. So not only do you have to issue safety equipment, but also hold training sessions on how to use PPE and the importance of using it. 6. Implement fire safety measures and drills. Ensuring compliance with fire safety regulations and holding regular fire drills is probably the single most important workplace safety measure. Provide for the required number of exit doors. All fire exit doors should be push bar doors. Keep the aisles and exits free of obstruction. Display floor evacuation plan prominently in every section and floor. Install fire extinguishers, fire hose, sprinklers, etc in places that are easily accessible. Fix a clearly specified assembly area, conduct fire drills regularly, and maintain records of the same. Combustible materials should be stored safely and in a location that’s far from the main working area. 7. Audit and ensure electrical safety. Almost all workplace equipment today functions on electricity. If it malfunctions or is not used properly, it can not only injure the worker using it, but also poses a danger to the entire property and everyone in it. So only fully trained workers should use equipment that is certified by regulatory authorities. Install concealed wiring, don’t overload outlets, and avoid use of extension cords. Make sure all the equipment is properly grounded. Unplug machines that are not in use or are being serviced / repaired. Conduct an electrical safety audit regularly. This can be done either in-house or by a third party auditor. 8. Design custom lighting for each task, section and area. Different tasks require different levels of lighting, so both poor and excessive lighting will affect your workers’ ability to safely perform a task without mishaps. For example, muted and dim lighting is enough to cover an aisle, but assembly, sorting and packaging sections need to be bright and well lit. Consult a workplace interior design professional to help you with these requirements. 9. Install safety signs for potential risk factors. Do a comprehensive risk analysis to identify, eliminate or at least minimise all the potential risks in your workplace. There is always a certain amount of risk involved in every operation, no matter how big or small. For example, it may be a wet floor or a blind corner. It’s very important to assess all these risks, and prominently display warning signs illustrating the risks involved. 10. Keep the workplace neat and clean. 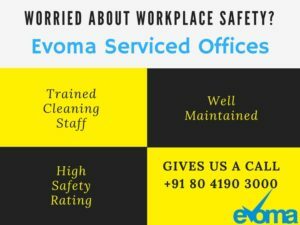 It’s an inglorious job, but your housekeeping and cleaning staff are a key element of workplace safety. Daily and vigorous cleaning helps prevent slips, trips, and falls – the leading causes of nonfatal workplace injuries. Keep the floors dry at all times, and immediately mop up spills and leaks. Collect, sort and place garbage as required in separate bins. Repair damaged floors instantly, and install anti-slip flooring where necessary. Walkways and exits must be kept clear, and store all the clutter in storerooms and other warehousing space.